On my rugby team, we used to have a captain who was like the team mom. She would make delicious baked goods all the time and bring them for us to eat after our games (needless to say, we were very sad when she retired to have a baby... lucky kid!). 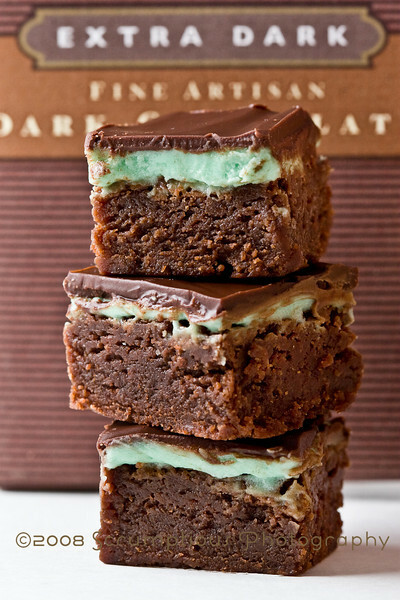 One of the most awesome things she made were brownies with a layer of mint frosting, so when I stumbled across this recipe, I knew I had to give it a try. The end result was SO GOOD -- rich brownie complemented by cool mint. These little guys (they were cut into 1" squares) were so tasty and easy-to-do that I made them twice in one week, the second time for my brother's birthday party, and both times they were a huge hit. Preheat oven to 325 degrees F (160 degrees C) and place the rack in the center of the oven. Have ready a 9 x 9 inch (23 x 23 cm) square baking pan that has been lined with parchment paper across the bottom and up two opposite sides of the pan, like a sling. (You can also use buttered aluminum foil for this, but I like parchment because for me, it tears less and is easier to work with.) Set aside. Brownies: In a stainless steel (heatproof) bowl placed over a saucepan of simmering water, melt the butter and chocolate. Remove from heat and stir in the sugar and vanilla extract. Add the eggs, one at a time, beating well (with a wooden spoon) after each addition. Stir in the flour and salt and beat, with a wooden spoon, until the batter is smooth and glossy and comes away from the sides of the pan (about one minute). Pour the brownie batter evenly into the prepared pan. 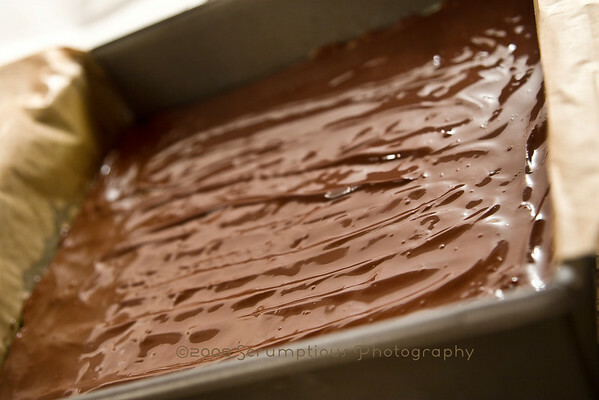 Bake in the preheated oven for about 25 minutes or until the brownies start to pull away from the sides of the pan and the edges of the brownies are just beginning to brown. A toothpick inserted in the center of the brownies will come out almost clean. Remove from oven and place on a wire rack to completely cool. Mint Layer: In the bowl of your electric mixer, or with a hand mixer, beat all the ingredients until smooth. Add a few drops of green food coloring if you want the frosting green. If the frosting is too thick, add a little extra cream. (The frosting should be just thin enough to spread.) 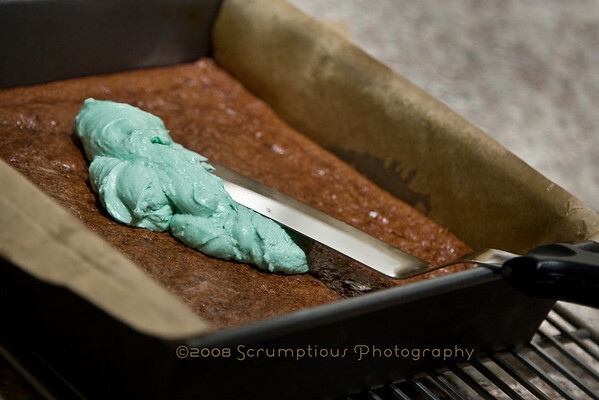 Spread the frosting evenly over the cooled brownie layer. Place in the refrigerator for about 5-10 minutes or until firm. Chocolate Glaze: In a heatproof bowl over a saucepan of simmering water, melt the chocolate and butter. Spread over the mint filling and refrigerate for about 30 minutes or until the chocolate glaze starts to dull. 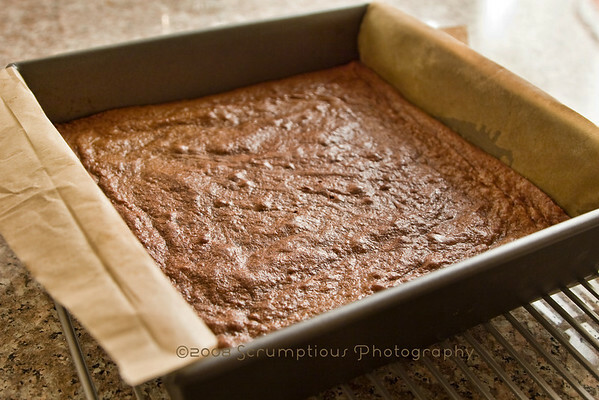 To Serve: Remove the brownies from the pan by lifting with the ends of the foil and transfer to a cutting board. With a sharp knife, cut into 1" squares (this makes 81 squares in the 9"x9" pan... in the original recipe she says 30, but unless they are bigger squares, it's 81). I rinsed off my knife with hot water after each cut, which made the cutting much easier and the glaze less prone to cracking during the cut. These brownies can be stored in the refrigerator for several days or else frozen. Makes about 81 1-inch (2.5 cm) squares. Rugby is such a fun sport!! :0) Wow, those brownies are the EPITOME of mint-chocolate goodness - yum!! Ooh, those look scrumptious! I love the color of the mint layer! These look amazing! I have got to make these! The look amazingly delicious! 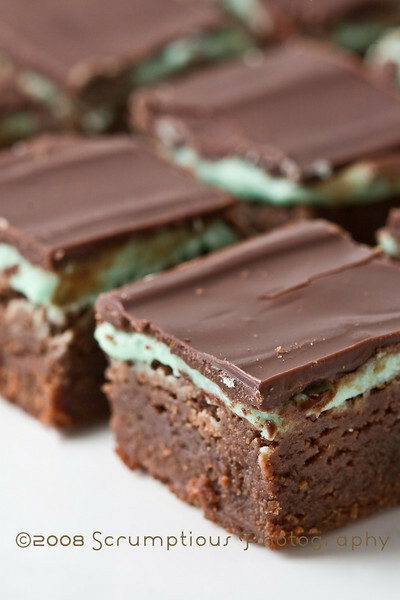 I love mint chocolate brownies! greek yogurt in place of heavy cream? wow, now that's a sub I'd never think of! But that sounds great, and the end result looks delicious.... going to have to try this one out next week when my folks are in town. I was going to try these this weekend, but I managed to put away an entire tub of Betty Crocker frosting between last night and this morning...think I've had enough sugar. ;) But I must try these soon...they look HEAVENLY!!! @cabbey, yea, i did the sub because i forgot the cream at the store, and it worked out really well so i'm going to keep on doing it! :) that is so cool about Found on SM, such great pics on there!! @isa, the base brownies are really good by themselves, but you can always put a different flavor in the icing if you want. Good lord, these look mighty fine! @ara & spirit, thank you, that is such a nice compliment! :) sorry to be so tempting when you are out camping, hehe. Definitely making these tonight. Amazing pictures! I've gained 10 lbs just looking at the photo but I have to make these! Okay, I am not a huge baker but I have to make those. They look great! nice, yummy recipe. i like it. 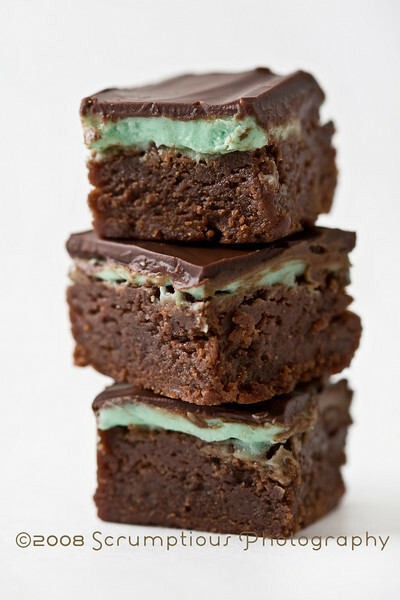 My mom used to make us chocolate-mint brownies when I was a kid, these look just like them! I've always wondered what her recipe was but she doesn't keep track of that kind of stuff, thanks for sharing this! I can't wait to try to make a vegan version. YUM! @dr pete, i took the photos :) thanks! @tracy, awesome, let me know how the vegan version turns out! Although mine didn't turn out that pretty (too impatient for the whole cooling process), they were/are sure yummy!! Thanks for the recipe. Nice recipe. I love chocolate recipes . I made these with my little nephew, we had so much fun making them and when we were done, OH MY GOD. soooo good. They look just like the picture (i used more chocolate and an extra tsp of vanilla in the brownie mix, and added more chocolate topping. It was amazing. A complete hit, and they were gone in a day. My boyfriend already wants more. OH NO! so good! thanks for the recipe! I make these every Christmas to give to friends and family. I think I should make a batch in July!! What a great combo - I love how the green just pops out. These will be added to the brownie's to make and eat list..
Looks like a great sweet treat, will have to whip some of these up ... I'm not a huge sweet fan, but mint and chocolate are right up my alley. Yum. I just gained 5 pounds from the pics! Just the title alone is scrumptious! Why do I keep stumbling upon blogs with desserts determined to make me break my diet? !These look delish! What an awesome stumble I just found! YUMMY! @mandapants, your changes sound tasty! this looks absolutely sinfull. love the dark chocolate frosting on top. These look so professional! Good job! They look fabulous, will definately be trying these - fantastic photos. YUM! I'll be trying these for xmas gifts! Those look great. Mint and chocolate are one of my favorite combinations. OMG these look soo good, i love anything that taste like mint. cant wait to make these. yummy yum yum!! Rugby? Mint? Chocolate? You sure know how to romance a girl. Cheers! WOW! I just saw this recipe and it looks AMAZING!!! @Anon, not sure what happened, what was your texture like? a couple of things to check are to make sure you didnt get any water in the chocolate that caused seizing, and that you melted over a pot of simmering water for slow and even heat. hope that helps you out! Wish my brownies turned out like your picture lol... I'm a guy so that's probably why.. They are really flaky on top and the middle part like went flat and the sides are up really high.. Anyways they are still Amazing tasting. These look absolutely amazing! How lovely! I will make them soon...! my brownies did not raise as much as the picture. What could have happend??? They are very thin. I love anything mint! These look so good. I can't wait to make them. Thanks for the delicious recipe. These look fantastic; must try! Definitely bookmarked as a looking forward to!!!! @Anon, hope you were happy with the taste! I would suggest getting an accurate oven thermometer so you can make sure you are at the right temp during baking. These brownies come out pretty dense and moist for me. Also, the final photos are super close up but they are basically 1" cubes. HTH! I've made these multiple times for over a year now and they are hands down the most popular sweet I've made (and I bake a lot!). I follow your recipe exactly, and the only problem I tend to run into is the baking of the brownie. I have an oven thermometer, but when I bake at 325 degress F, it takes like 40 mins+ for the toothpick to come out almost clean, but by that time the sides of the brownie is super hard and raised while the center sinks in like crazy. Baking at 350 helps just slightly. Regardless, they always taste amazing and that is what counts the most! Thanks for the amazing recipe!! Oh man! I wish I had seen this yesterday! These would have been perfect to take to work today for St. Patty's Day. Oh well, I don't have time to run to the store to get the stuff before making them now. Wow that looks delicious. I am absolutely in LOVE with the mint and chocolate combo. So is my boyfriend -I will make these for him very very soon!! Amazing - This will go down a treat in our household. Mint and chocolate is a sure fire winner! I made these two days ago and they went down a treat. Everyone loved them. Many thanks! Such a cool looking dessert. I'm a fan of anything mint, so this recipe is a keeper. Can't wait to try it. Che buoniiiiiiiiiiii e che belliiiiiiiiiiiiii!!!!!!!!!!!!!!!!!!!!!!!!!!!!!!!!!!!! !